Notice how scared they are? OBTW: Three humans can easily fit on that couch. The dogs weigh between 90 and 135 pounds each. If there are not enough pillows on the couch, they go get more so they can be comfortable. 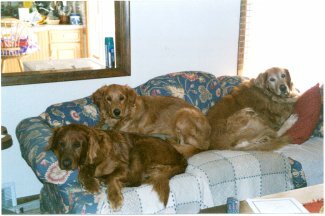 Berkley (middle) is lying on his favorite one. Piper (right) took the one she has from Chelsea (left). Our Beta Female. She gets beat up by all the other dogs. She's the nicest dog you've ever met. When she gets frustrated, she cries like a human. It is very freaky. If she is foiled by one of the other dogs, you'll hear a distinct, loud and very long 'Ohhhhhhhhhh!'. Chelsea passed on a couple of years ago. It has taken me a while to type this in. I miss her and her evil step-sister Piper (below). The alpha female waking me up in the morning. She figures its her job to keep everyone awake during daylight hours. If Sue goes to work early, two minutes after she leaves the house, this is what I see when I roll over in bed. Piper is getting fat - because she steals and eats *everything*. Piper and Chelsea passed on a few years ago. They both died within a few weeks of each other. It is hard to relate it. They were and are part of the family. Peaches is a rescued dog. She had a traumatic childhood. She was a runt and was passed around - at one point she had been in the dog pound two times. 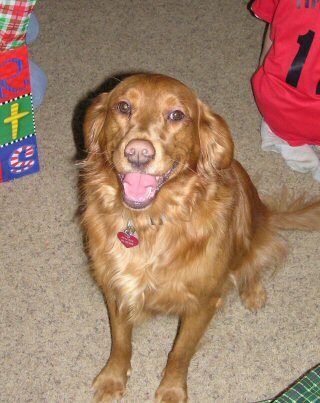 The Golden Retriever Rescue In Nebraska got her out of the pound and we found her through them. We wanted a companion for Berkley after his two moms passed on. Peaches is a sweetheart. 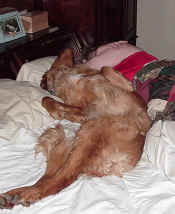 She is typical female golden - bossy with Berkley and jealous if you pet him first. She likes to talk to you - similar to the way Chelsea did. She's been with us several years now - and her brown muzzle is getting white. She has a heart of gold and we are so happy to have her. Berkley and she get along wonderfully. Wait a second. 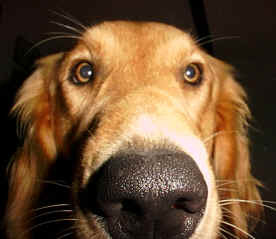 This is supposed to be about Goldens! 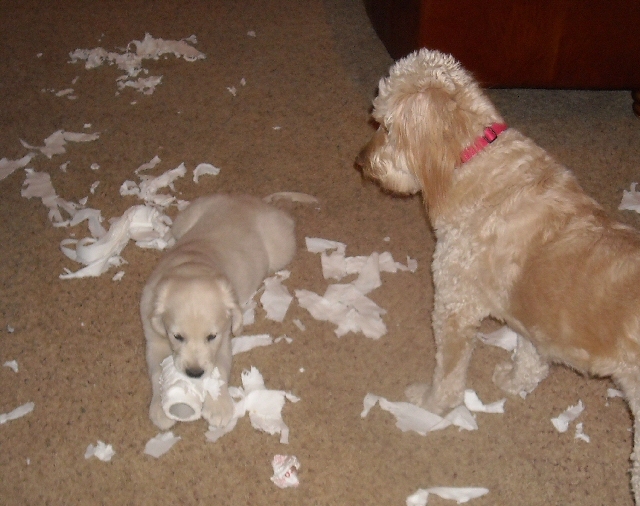 OK... Cooper is a new puppy and he is 1/2 Golden and 1/2 Poodle. 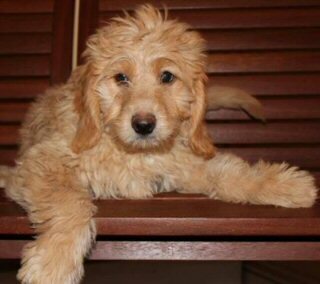 A Goldendoodle. Yes... we have a designer dog. Cooper figured out how to climb stairs, go through dog doors, and retrieve a tennis ball (sort of) by his second day with us. I have a feeling our life is going to be hell. ;-} Update: Our life is hell. 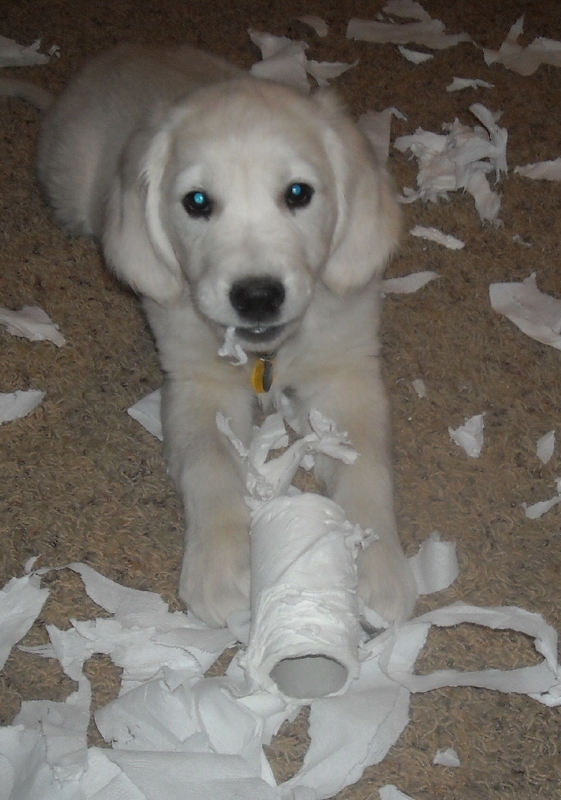 The little $hit gets into everything and plots against you. He is more like a monkey than a dog. He then erases all the ill will by walking over and hugging you and then laying on your feet. And yet another puppy! This is Boone. His name is great (Boo, Boonedog, Boonedoggle, etc). 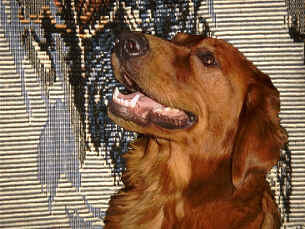 This guy is a typical Golden - in this case a cream colored one. This is Cooper supervising Boone (really). GR is no longer with us. We have many great memories about him. Did I tell you about the time he shut down the St. Louis Airport? True story. I lost the original so this is the only one left of these two doing mock battle. Sure look mean, eh? They would never bite each other. They would just pose like this for long periods. Abby is a mutt. 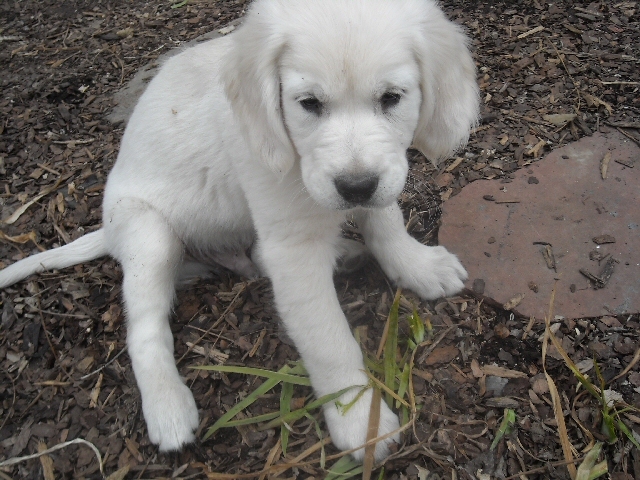 She is somewhere between 6 months and 8 months old in this picture - when we first got her. 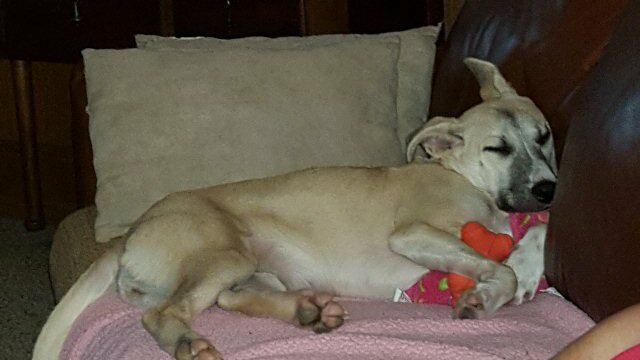 She was a rescue dog that was thrown from a truck window and recovered by a passing motorist. She was very sick and required a couple of months to heal. She was then put in a no-kill shelter where she met Sue. She immediately adopted Sue and whenever Sue (who volunteers there) came to visit, Abby would jump up and snuggle with her the whole time. She won Sue's heart and one day she came home to meet the other dogs. This picture is of her on her second day at the house. We gave her some toys and she fell asleep with them in her paws. Abby had a hard life until she met Sue - now she is getting spoiled. She has decided that her new home is heaven and the two male dogs are her slaves. She tries very hard to make sure her new home is permanent. When you walk her, she stays right at your side - there is no need to pull the leash when your best friend and savior is right there beside you. 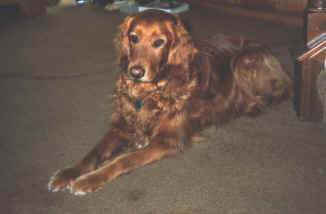 Katey was our first Golden and she was the one that got us hooked on them. A really smart dog who knew a dozen tricks and who could talk back to you if she felt she was wrongly accused of something.